Indian food is one of my top choices on a cold night. It’s warm, sometimes spicy, and always delicious! If you’ve ever made your own Indian food though, you’ll find there’s often a long list of ingredients. I’m an adventurous cook, so sometimes I’m up for that, but not on a busy weeknight. 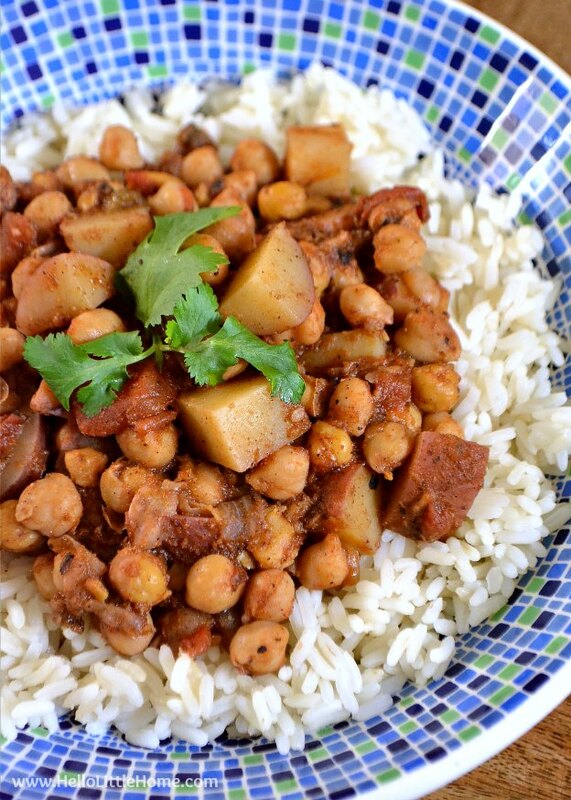 This easy Chickpea Potato Curry however, couldn’t be simpler to make. There are only a few ingredients, but it still has all those wonderful, fragrant Indian flavors that you love. You’re going to want to make this recipe tonight! 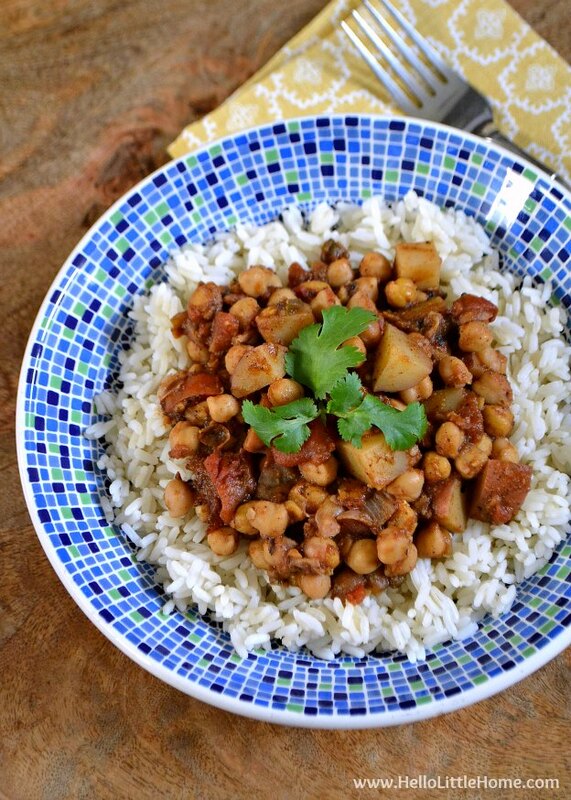 This easy vegan curry is the perfect weeknight meal! 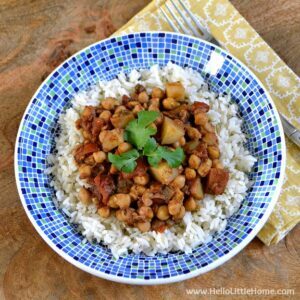 The ingredients for this Chickpea Potato Curry are so simple … you probably already have most of them in your pantry. Plus, it’s just so easy. This is the kind of meal that will actually motivate you to cook on busy evenings! This vegetable curry is simple to make. You’ll start by sauteing some onions, then add in your spices. Nothing fancy here, just a little garama masala (curry powder may also be used), garlic, jalapeno, and ginger … so fragrant and so delicious! Then, you’ll add the chickpeas and potatoes, throw on the lid, and let everything simmer away. Give the curry a stir or two, and soon enough, you’ll have a delicious meal in a hurry. 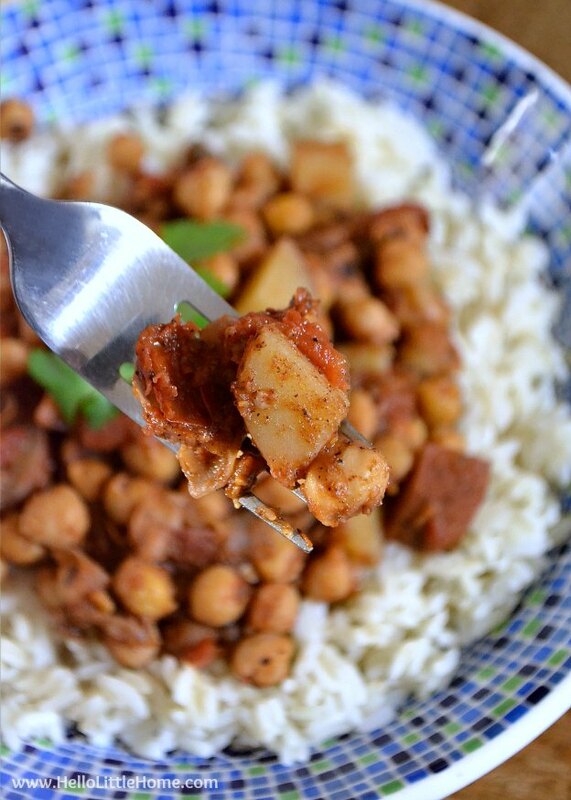 I like serving this easy Chickpea Potato Curry over rice (basmati would be delish). Dinner is served! 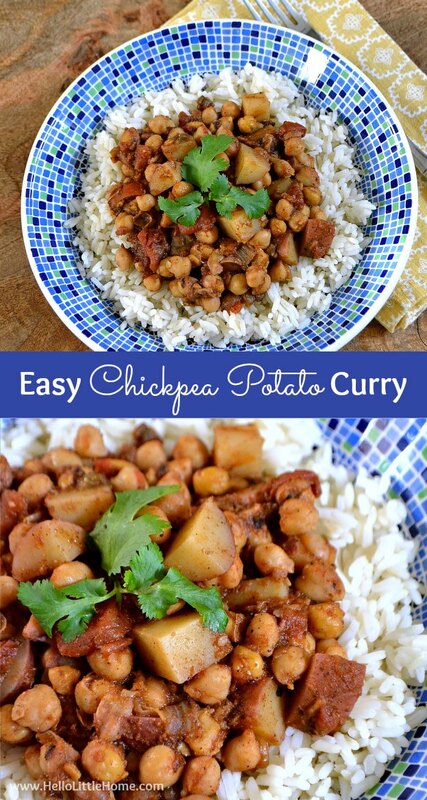 This Easy Chickpea Potato Curry is the perfect weeknight dinner ... ready fast and so delicious! Add onion and cook a couple minutes, until it starts to soften and brown. Stir in ginger and jalapeno. Cook for a minute, then add garam masala, garlic, and salt. Stirring constantly, cook until fragrant, about 30 seconds. 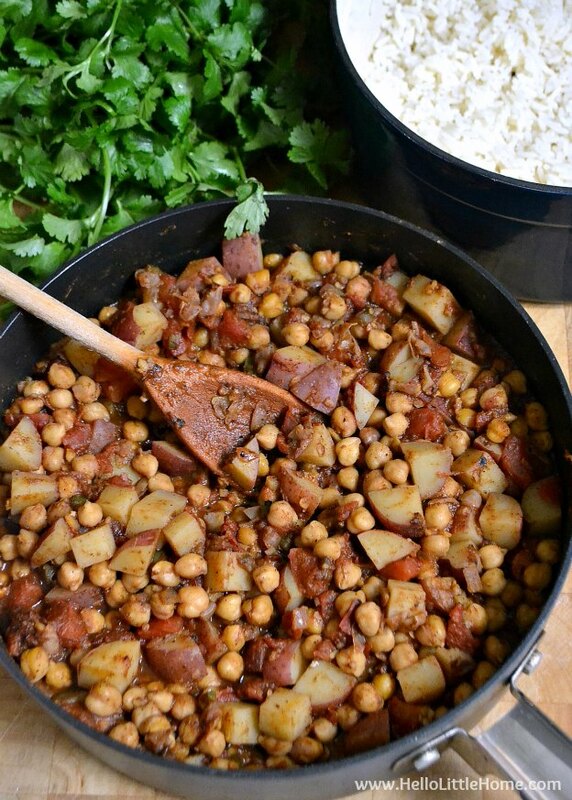 Stir in potatoes, chickpeas, and tomatoes. Fill tomato can with water; stir into pan. Bring to boil, then reduce heat to a simmer. Cover pan and cook curry until potatoes are tender, about 25 minutes, stirring occasionally. Add more water if curry gets too dry. Previous Post: « The Ultimate DIY Christmas Gift Guide!